My favorite leading lady in Disney cartoon movie is not a princess. Let me clarify that this category is totally different from my favorite full-fledged Disney cartoon movie villain which is Ursula The Sea Witch. Female Disney characters most especially the popular princesses would usually be characterized at the start of their respective stories as weak, fragile, innocent, helpless and gullible. A typical picture of damsels in distress or youthful naivety. These Disney ladies as the story unfolds would only develop strength and conviction after having met severe trials and tribulations. And usually their advancement for personal potency and realization for self-conviction would usually entail the help of a prince or a knight in shining armor. These platitudes are totally not true for the vivacious Megara. Nicknamed, Meg. Unlike other female Disney characters, Meg already possess a tough, brazen and resilient character at the start of the 1997 Disney cartoon movie Hercules (which by the way is my favorite Disney cartoon movie). Meg is not the naïve sweetie type girl possessing an innocent high pitched voice. She instead is a woman with an appealing sexiness coupled with an alluring husky voice of seduction. 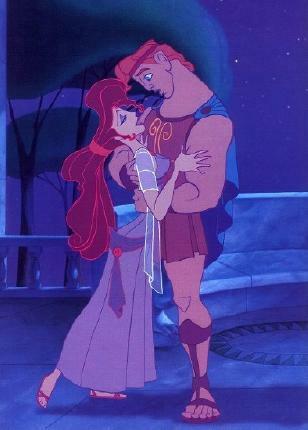 Meg actually started in the film being part of the group of adversaries and foes of Hercules. She’s one of the minions of villainous Hades and was kicking a lot of Olympian butts until she later softened up and fell in love with the virile and charming Wonder Boy. Though not well emphasized in the film, Meg’s past is not all cakes and sunshine. Prior to meeting cool dude Hercules, Meg sold her soul to Hades to save an unfaithful boyfriend. This of course characterizes her being a woman with admirable guts and intense personal passion. And being an experienced woman, this sets Meg apart from the other virtuous and virginal female leads of Disney. Because of this unique persona, Meg for me is the best Disney female character ever. I totally adore her depth and maturity. She for me seem to be the closest to reality. No fancy neither fantasy! She may not be a Disney princess but she indeed acts and possess the traits of what a mature smart-aleck woman should be. ‘Aktwali, mas birgin at inosente pa si Herkules sa kanya!